Delaware is known as The First State and it s home to several popular cities, such as Wilmington, Dover, Lewes and Rehoboth Beach. Its various cities and regions offer their own cultural and recreational attractions, and no sales tax makes the state a shopper s paradise. There are numerous active adult communities in Delaware that offer a variety of home sizes and styles. Though Delaware may be small in size, its transitional climate and distinct regions make it an ideal location for a variety of people. 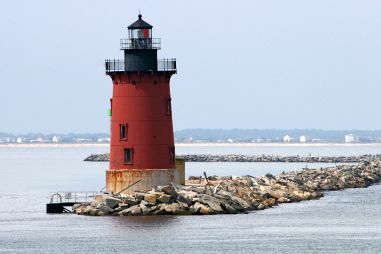 From the industrialized north with its easy access to major urban centers, to the southern coast with its sunny beaches and artistic charm, Delaware is quickly becoming a popular retirement destination for active adults. For those who prefer all four seasons, Delaware s environment covers a transitional zone, which ranges from a humid subtropical climate to a continental climate. There is often a noticeable difference in temperatures and weather from the northern to southern portions of Delaware. The southernmost Sussex County generally enjoys more mild winters and hotter summers than the more northern areas of New Castle County. Geographically, Delaware is bordered to the south by Maryland and to the north by Pennsylvania. The eastern border falls along the Delaware River, the Delaware Bay and the Atlantic Ocean, which all flow together from the river out to the sea. Though the Delaware River lies between Delaware and New Jersey, there are a few small stretches where the two states share a land boundary. Ferries also allow easy transportation across the Delaware River, such as the popular run between Cape May, New Jersey and Lewes, Delaware. Despite its small size, Delaware is one of the country s more densely populated states. Wilmington boasts many cultural and recreational attractions. It also embraces a rich history as the city was first settled in 1638 under the name Fort Christina. Today, Wilmington offers a variety of distinct neighborhoods including nine historic districts and the Wilmington Riverfront. Farther south, Delaware s capital city of Dover is the second largest city in the state and a popular destination for visitors. The Dover International Speedway hosts two NASCAR weekend events each year. Dover Downs, also contained within the Dover International Speedway, offers harness horse racing year-round. There are several golf courses in the area surrounding Dover, including the Maple Dale Country Club, the Wild Quail Country Club, and the Jonathan s Landing Golf Course. For those who prefer performing arts, history and other cultural attractions, Dover s Schwartz Center for the Arts is home to the Dover Symphony Orchestra. Dover s historical district is home to the Sewell C. Biggs Museum of American Art, and downtown Dover houses the Dover State Museum as well as the Dover State Archives, which are open to the public. A bit farther south on Delaware s Atlantic coast, Rehoboth Beach swarms with visitors during the hot summer months. Rehoboth s beach boardwalk features an eclectic mix of quirky shops, fun restaurants, festive nightlife, and plenty of recreational activities. Rehoboth Beach has a welcoming atmosphere and is also known to be a popular gay and lesbian vacation spot. In addition to its boardwalk attractions, Rehoboth hosts annual festivals such as the Rehoboth Beach Independent Film Festival and the Rehoboth Beach Autumn Jazz Festival. Though Delaware s cost of living is 14 percent higher than the national average, the state is still very attractive to active adults due to its moderately low taxes. Delaware does not have a sales tax, the top income tax rate is 6.95 percent, and property taxes are some of the lowest in any state at .43 percent. Social security benefits are not taxed and up to $12,500 of pension income is exempt for people 60+, which means many seniors pay little income tax to the state. As of 2012, there were 2,439 physicians practicing in the state, which makes the ratio of about 266 active physicians per 100,000 residents. Christiana Care Hospital in Newark is a nationally ranked hospital in adult specialty. In addition, Bayhealth Medical Center in Dover and Beebe Medical Center in Lewes are two high performing hospitals. Healthcare is also one of the state s leading job industries.